Extra 20% off select Dress Styles through 5/26. 20% off any order through 3/30. $20 off Boots through 3/9. 20% off any order through 3/8. 14% off any order through 2/14. Men's RATSONE Boots Was: $150 Now: $105 through 2/8. Women's KEANA Ankle Boots Was: $110 Now: $77 through 2/8. Extra 50% off Sale Boots through 2/3. Extra 30% off Sale Boots through 2/2. 30% off any order through 12/26. Our Aldo Coupons are updated everyday to provide you with the latest and greatest Aldo deals. If you need assitance or additional information on specific Aldo coupon codes or Aldo offers please feel free to contact us. 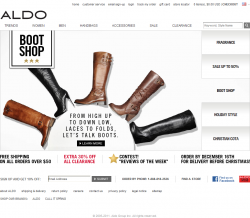 To activate an offer click the applicable Aldo coupon code or Aldo deal to activate the promotion. If there is a coupon code available, enter the coupon during checkout to have the savings applied to your order. If no coupon is available, the savings should be automatically reflected in your cart.